Many of KDAB’s customers use OpenGL and OpenGL ES to achieve visually stunning, high performance graphics and user interfaces. Even if you aren’t using OpenGL directly, components of your application, including HTML engines, mapping & navigation systems, rich 3D content providers, media libraries and more, can all be using OpenGL under the hood. OpenGL plays also a very important part in Virtual Reality and Augmented Reality. KDAB maintains much of the OpenGL integration within Qt 5 and is the main contributor to the Qt 3D framework. 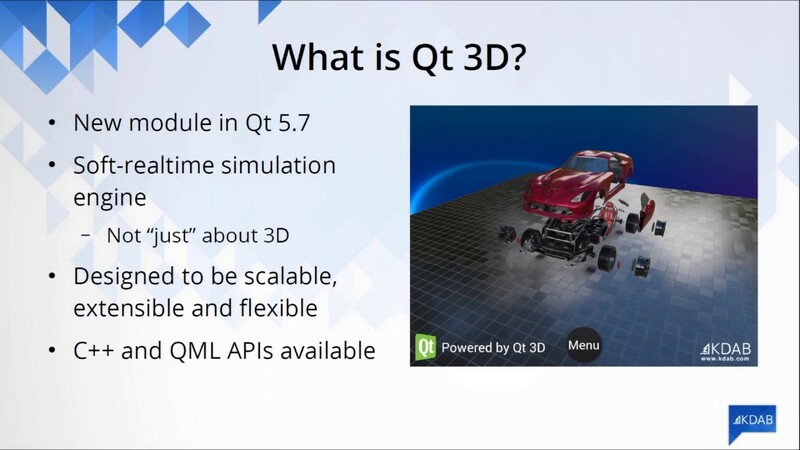 Qt 3D is part of Qt 5 and provides a high-level, easy to use set of C++ and QML APIs for integrating 3D content and related features into your applications. Having built Qt 3D from the ground up, KDAB is uniquely positioned to provide in-depth assistance with its deployment, configuration, extension and optimization. Get started with Qt 3D through on-site trainings and workshops to augment your existing knowledge today by contacting us at info@kdab.com. KDAB is the world's leading software consultancy for architecture, development and design of Qt, C++ and OpenGL applications across desktop, embedded and mobile platforms. KDAB is the biggest independent contributor to Qt and our experts build run-times, mix native and web technologies, solve hardware stack performance issues and porting problems for hundreds of customers, many among the Fortune 500. KDAB’s tools and extensive experience in creating, debugging, profiling and porting complex, great looking applications help developers worldwide to deliver successful projects. We provide market leading training with hands-on exercises for Qt, OpenGL and modern C++ in multiple languages.. We are about 90 people, located all around the world. Our Head Office is in Sweden and we have other offices in Germany, France, the UK and the USA.